Col. D. Jacir contributes the following note on his Scottish period. It was in 1943 that, as a member of the recently formed SAS, I was on manoeuvres in Scotland. The survival course involved iron rations of which the main element was pemmican, a source of food distinguished more by its dietetic than its gastronomic appeal. We were (after all it was one of the qualities we were chosen for) an inventive group and it didn't take long to discover that trinitrotoluene, provided one did not include a detonator, made an excellent fire lighter when all one had was a heap of wet bracken getting wetter by the minute in the rain. The end of the salmon season had been good to us and I can recommend camouflage netting as an impromptu tool for the military poacher. Grilled salmon made a nice change from the awful, pemmican based rations. All good things come to an end, however, and the salmon season is no exception. Thus one cold winter's morning we decided to try another means of procuring a little more palatable protein. We had an inflatable boat and pushed it out onto the nearby loch. There was one of those strange fogs which hang low over the water; if you stood up you could see for, well, yards. When you sat down the horizon closed in to the end of the boat, the fog as thick as Woodbine smoke in a NAAFI bar. We headed out into deep water and took out a lump of explosive (there was no shortage of that at least) and a 2m pencil detonator. Throwing it into the loch we rowed back to shore as fast as possible. We were only half way there, however, when it went off, the explosion showering us and the landscape with pieces of wood and bits of fish flesh, none however in anything approaching edible condition. Some of the bits of fish did seem rather large however and excited surprised, as well as disparaging, comment from our disappointed fellows but it was only later that I learned that this loch was special. They had said it was called Loch Ness, indeed it was marked as such on the map, but nobody had thought fit to enlighten the French contingent of the existence of a monster. Still less did the map, old as it was, say "monsters be here". 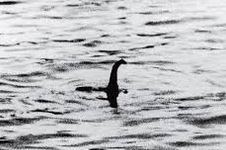 I fear the worst and pangs of guilt haunt me still as I peruse the papers in the newsless summer "silly season" when articles crop up about yet another expedition coming up with "No concrete evidence to prove the existence of an exceptionally large life-form in the loch." Colonel Jacir was President of ANAP, the Association National d'Anciens Parachutistes, and was also for many years on the "Commission de la flamme" which organises the daily "reanimation de la flamme" ceremony at the Arc de Triomphe in Paris. He died in September 2017.